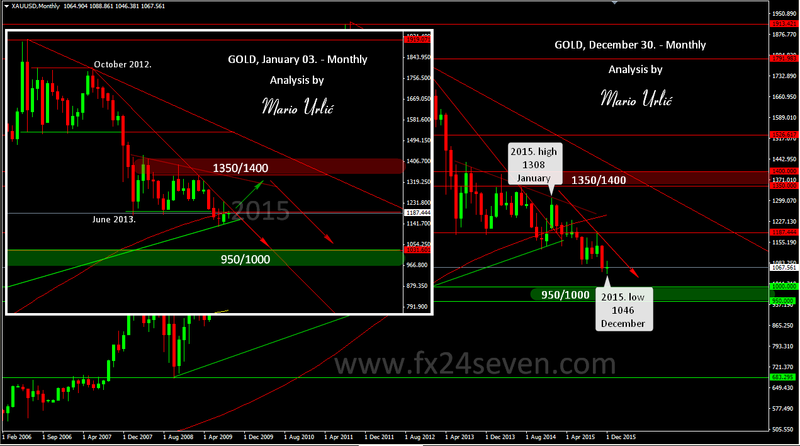 In the beginning of the year, at January 03., I have made a gold analysis and price move prediction for 2015. My predicted price range was in between 1350/1400 on the uper side and 950/1000 on the down side. In my analysis I was pointed for possible bulls attack at first, after wich the bears will take over and push the price down toward 1000 and that was the exact move in 2015. The buyers have pushed the price in January to 1308 and that was the high of the year, after wich the selleres have took over the price and push it down true the year with not much reversal, all the way to 1046 low in December. Gold price was open 2015. at 1160, it will ended at aprox 1067, which shows another bearish year for the precious metal. As I wrote in my analysis from the begininng of the year, I don’t expect for price to be calm as in 2014. where gold price was down for only 1,7% at the end of the year, in 2015. gold price lost 8% of the value. We will see what will happen in 2016., it could be interesting year for the precious metal.